Update! Lady was awarded Serenity Park USDF Breeders Classic Reserve Champion Mare Over 4 on a score of 76%, as well as the USDF Mid-States Finals Mare Over 4, on scores of 73.5 and 75.4 with comments praising her excellent broodmare type, her substance, as well as her disposition. 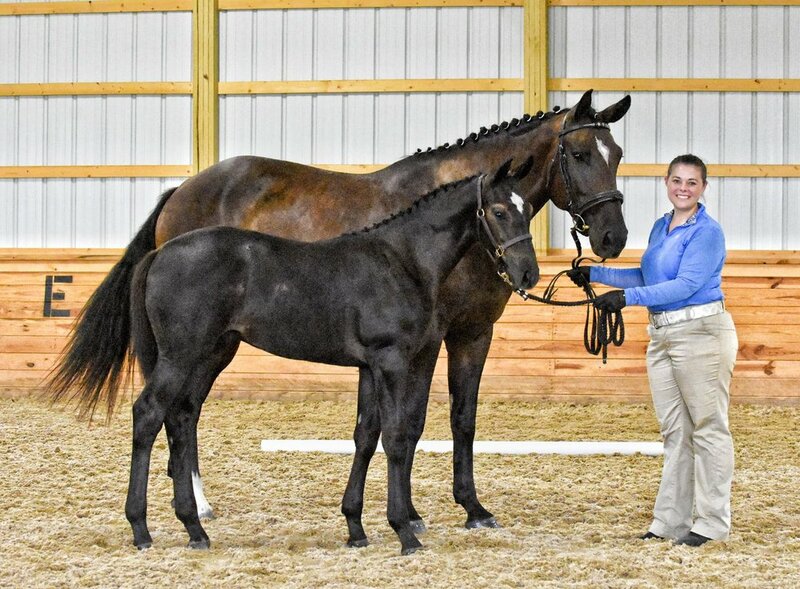 Her colt, Morningside LSE is now the Serenity Park USDF Breeders Classic Current Year foal Champion on a score of 77%, and the USDF Mid-States Finals Current Year Foal Champion with a score of 75.7%. Sid received especially high compliments on his manners and disposition—Including an 8 on General Impression, and the comment: “Incredibly well mannered”. Sid was also awarded the Premium Foal title due to his excellent inspection scores of 8 in every category. 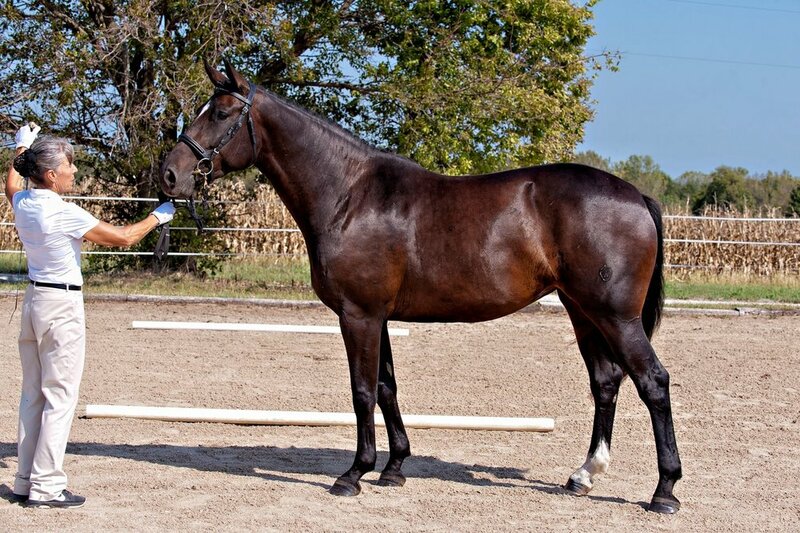 "Lady" is a 2012 Book I Main Mare Book Westfalen mare, as well as Main Mare Book Oldenburg NA on the score of 102.5--she is eligible to be upgraded to Premium in both registries. She has a superbly quiet nature, gentle disposition, coupled with incredible athleticism, grace, and balance, especially for her size. Sid will be her only foal in the near future, as she will enter training upon his weaning. She, and her colt, are always complimented on her quiet demeanor, calm presence, and willing attitude. She is showing great willingness and style through the free jump chute, which comes as no surprise, as her sire is none other than LaMarque of Wild Turkey Farms. 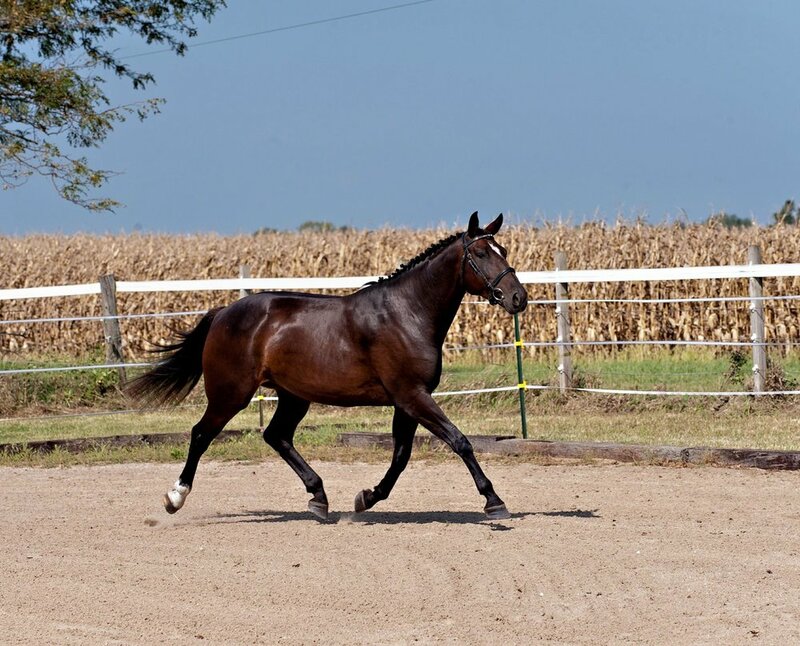 Lady's dam, Lady Lyndon is sired by Elite Hanovarian stallion, Lehnsritter, and out of a Thoroughbred mare with excellent sport bloodlines. Lady Lyndon herself was a lovely mare who competed in both Show Jumping and Eventing with her amateur owner before becoming a broodmare. LaMarque is an impressive stallion by Lansing. 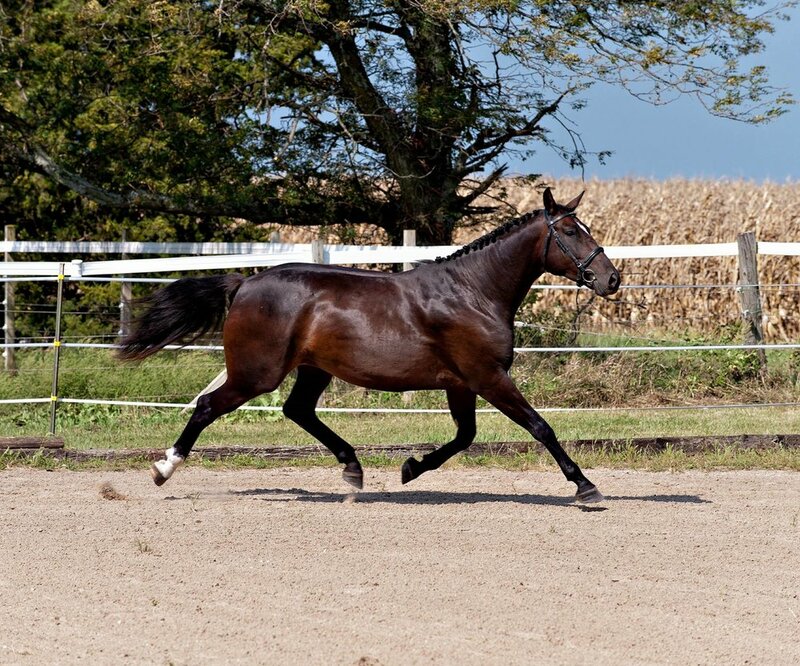 During his stallion testing at the AHHA approvals, he was overwhelmingly superior in the jumping phase, earning the highest marks possible: perfect 10’s for technique, scope and willingness. His total combined score of of 48 (canter: 8, performance potential: 8.85, rideability: 8.75) boldly demonstrated the quality of his lineage. LaMarque’s exceptional character and performance abilities are undoubtedly influenced by his impeccable lineage that includes some of the most influential stallions of the century including Lansing, Carthago Z and Lord Calando. He has Ladykiller bloodlines on both is Dam and Sire’s side from Landgraf I and Lord. Lehnsritter successfully competed through the FEI levels of dressage, some of the highlights of his career include his 1998 Grand Prix Debut and USDF Gold Medal Award, in 1998 he was named USDF Horse of the Year, and scored 71.7% in his Intermediare I Freestyle. 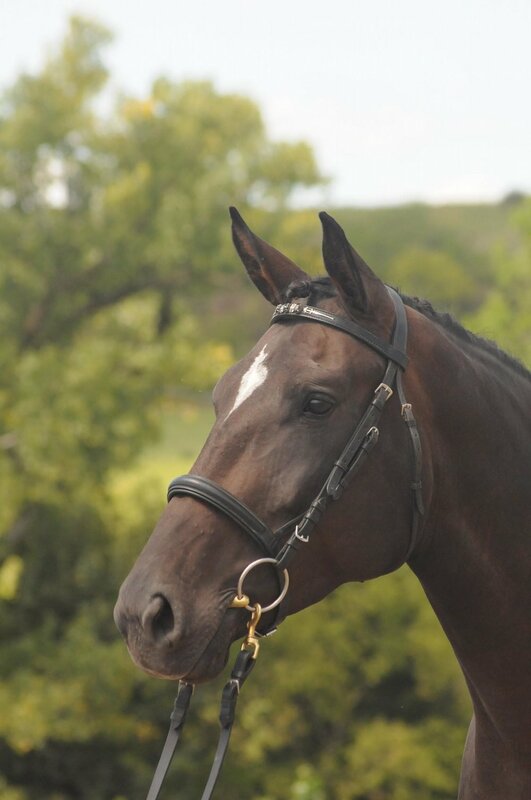 His offspring are competing successfully in dressage at many levels, some are also competing well in the hunter ring! 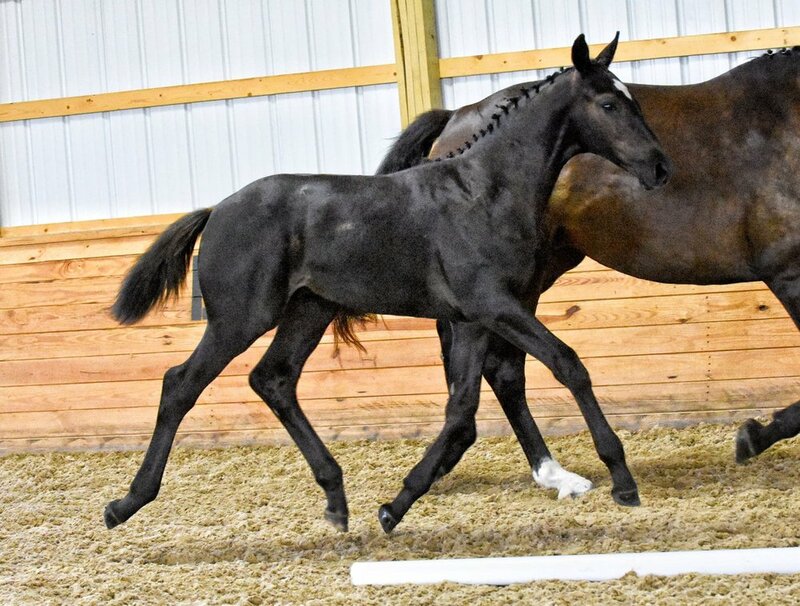 Lady had her first foal this May, a beautiful, Premium Oldenburg colt by Mannhattan, additional details Morningside LSE located on our "For Sale" tab.